KARACHI: At least a third of glaciers in the Hindu Kush-Himalayan range will melt away this century due to climate change, warns a new study formally launched in Nepal on Monday. The study released by the Kathmandu-based International Centre for Integrated Mountain Development (ICIMOD), reveals that even if carbon emissions are limited to 1.5C to avert the worst impact of climate change, 36% of the glaciers found in the region will be gone by 2100. The ICIMOD report suggests if Paris Agreement’s long-term goal to keep the increase in global average temperature — well below 2 °C above pre-industrial levels — is not achieved and global greenhouse gas emissions continue at their current trajectory, two-thirds of the region’s ice mass will be lost within this century. The Hindu Kush Himalaya (HKH) range is described as the “water tower of Asia,” due to its glaciers that play an important role in ensuring water, food, energy, and environmental security for much of the continent. Also famous for being the greatest mountain systems in the world, its highest peaks such as K2 and Mount Everest, unique cultures, diverse wildlife and landscapes cover 4.2 million kms across eight countries: Pakistan, Afghanistan, India, Bhutan, Myanmar, China, Nepal and Bangladesh. The report, “Hindu Kush Himalaya Assessment: Mountains, Climate Change, Sustainability and People” has been produced by the Hindu Kush Himalayan Monitoring and Assessment Programme. According to the report, the Hindu Kush-Himalayan region is sensitive to climate variability and changes. Adapting to climate-induced threats requires a thorough understanding of changes in climate in the past and possible changes in the future. The study finds snow-covered areas to be on the decline in most regions over the coming decades due to increased temperatures. It is projected that glacier mass loss will accelerate through the 21st century. 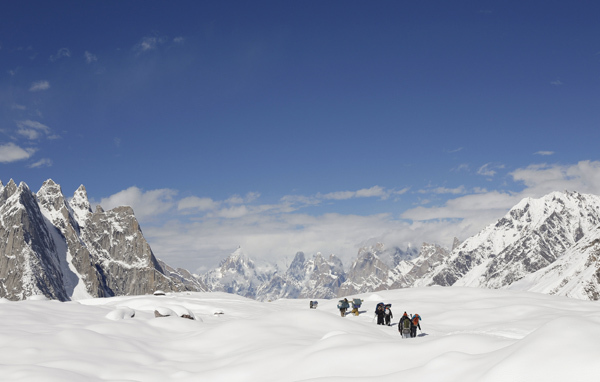 The region is experiencing increasing variability that will likely contribute to increases in glacier mass in the Karakoram and western Himalaya. 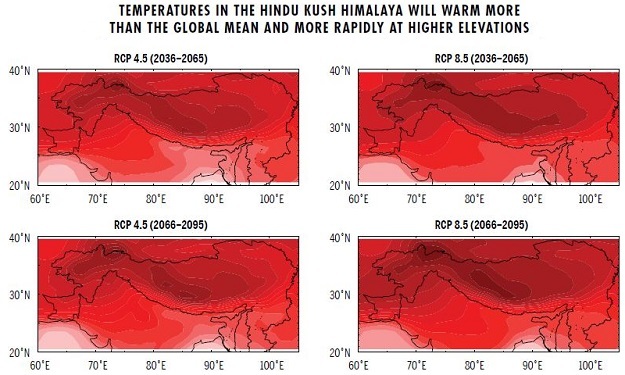 Even if global warming is limited to 1.5˚C, warming will remain at least 0.3˚C higher in the Hindu Kush Himalaya (HKH), and at least 0.7˚C higher in the northwest Himalaya and Karakoram regions of Pakistan. The report suggests the development of long-term scenarios in order to overcome uncertainties and enable short-term actions for societal and environmental changes. If the business, as usual, continues between now and 2080, the region may run downhill instead of advancing toward prosperity, warns the assessment. The study finds that the Hindu Kush Himalaya region provides crucial ecosystem services to over two billion people. Much of its biological diversity is yet to be explored and in need of conservation and research. 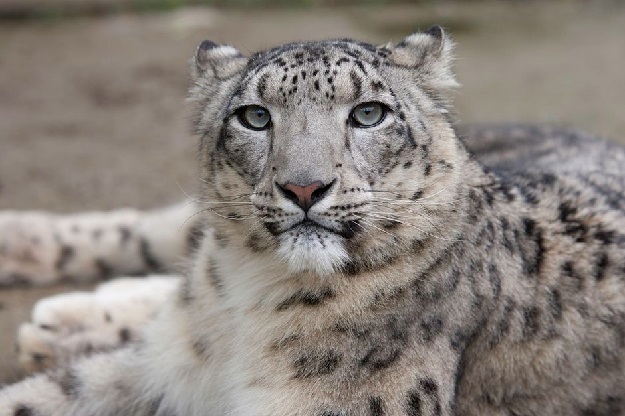 An average of 35 new species were discovered each year, between 1998 and 2008 in the eastern Himalaya alone. Development of the region’s vast potential of hydropower and other renewable resources is strongly urged in the assessment. Rampant energy poverty can only be overcome if the full potential of renewable energy is explored and energy security attained by mitigating and adapting to climate change, highlights the study. Climate change is posing a major threat to energy security and livelihoods in the region with more than 80% of the rural population in the region relies on traditional biomass fuels for cooking and about 400 million people still lack basic access to electricity. 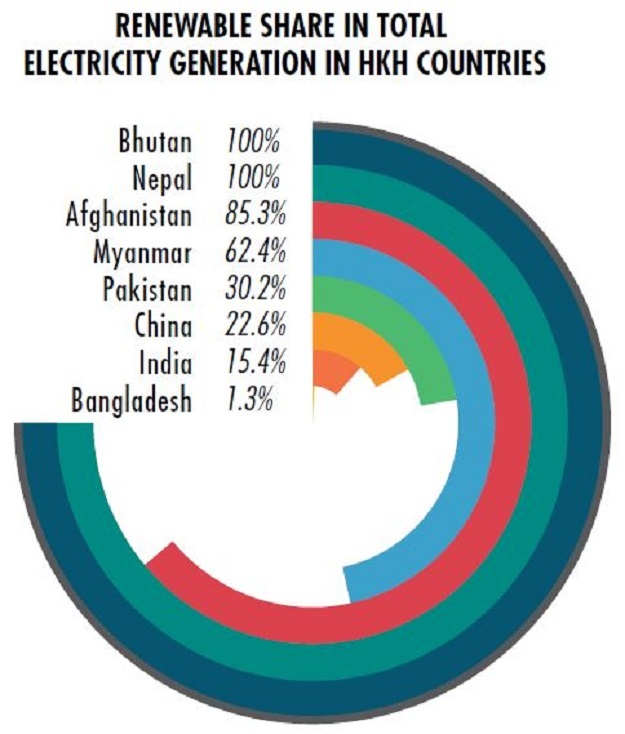 Figures of the total of electricity generation estimate a renewable energy share of around 100% in Bhutan, 100% in Nepal, 85.3% in Afghanistan, 62.4% in Myanmar, 30.2% in Pakistan, 22.6% in China, 15.4% in India and 1.3% in Bangladesh. Frozen waters (cryosphere), present in form of glaciers, snow, permafrost and ice are said to be a key freshwater resource for many river basins. Changes in the cryospheric system may thus pose a threat to the industrial, agricultural, and hydroelectric sectors that can further exacerbate the threat of disaster risk in the extended Hindu Kush Himalaya region. The study finds that snow-covered areas will decrease in most regions over the coming decades due to increased temperatures. Glaciers continue to decline, retreat, and lose mass across the region since the 1970s, except for parts of the Karakoram, eastern Pamir, and western Kunlun. It is projected that glacier mass loss will accelerate through the 21st century. Water security has emerged as a subset of human security — one that has been raising serious concern throughout the early part of the 21st century. Nearly 1.65 billion people living in downstream river basins benefit directly and indirectly from its resources. 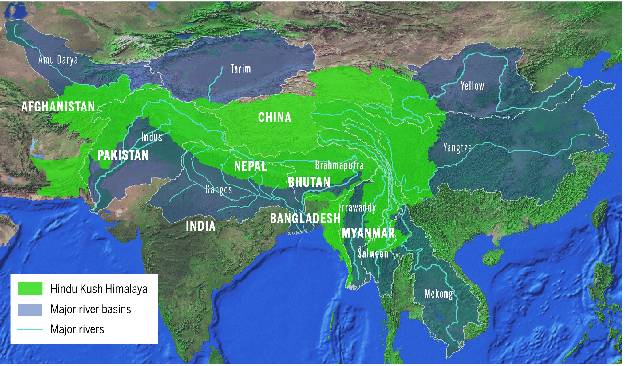 The Hindu Kush Himalaya region is described as the “water tower of Asia,” and plays an important role in ensuring water, food, energy, and environmental security for much of the continent. The region has a total of 500 gigawatts (GW) of hydropower potential, of which only a small fraction is actually developed. As a result of climate change, a consistent increase in streamflow is expected at large scales for the upstream reaches of the Indus, Ganges, and Brahmaputra rivers until at least 2050. In the Indus, this increase will result from increased glacial melt for a limited period, while in the Ganges and the Brahmaputra, it is expected to result mainly from increased precipitation. 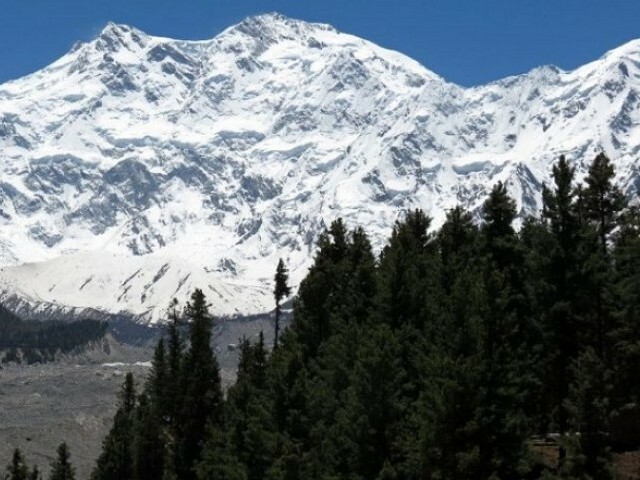 In recent years, late melting of glaciers due to high climatic snow line has made seasonal water scarcer in the Upper Hunza region of Pakistan, finds the research. The study confirms widespread food and nutrition insecurity in the region with 30% of the local population suffering from food insecurity and around 50% are suffering from some form of malnutrition, with women and children suffering the most. The causes of food and nutrition insecurity include factors like high poverty, natural resource degradation, climate change, low market development and inadequate policy. The report indicates a substantial rise in air pollution across the region with worsening air quality in the past two decades, resulting in the Indo-Gangetic Plains to be considered as the most polluted regions in the world. Persistent winter fog and haze across the region has been affecting air quality, due to which levels of particulate matter have increased. Three urban cities in the region, including Peshawar (Pakistan), Mazar-e-Sharif (Afghanistan), and Kabul (Afghanistan), that are included on the list of the 20 most polluted cities in the world. 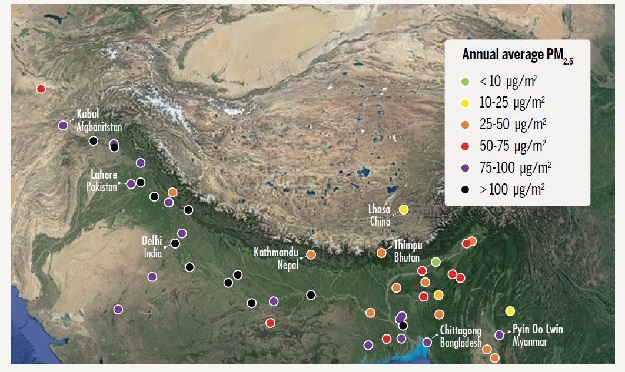 The rise in more than 10 times of higher concentrations of pollutants on an annual average is noted in over 12 cities across the Hindu Kush-Himalayan region, these cities include Agra, Allahabad, Amritsar, Jaipur, Patna, Dehradun, Delhi, Lucknow, Ludhiana in India; Peshawar, Rawalpindi in Pakistan; and Narayanganj in Bangladesh. According to the study, more than one billion people are at risk due to exposure from increasing frequency and intensity of natural hazards. Disaster risk reduction is particularly important in mountain areas for many reasons, including the multi-hazard environment, land use pressure, and the effects of climate change. The report stressed for urgent action to climate change adaptation, in order to sustain mountain environments and livelihoods with concerted action are required to keep global warming to less than 1.5 ˚C by 2100. 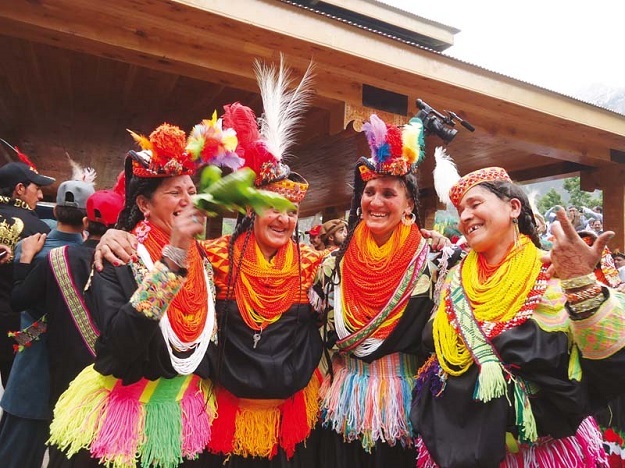 The Hindu Kush-Himalayan region is home to the region’s poorest, politically and socially marginalised people that are often ethnic minorities and tribal groups. 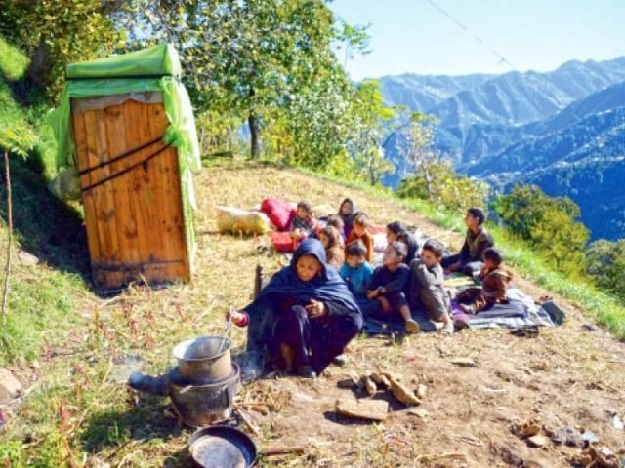 Data reveals one-third of the mountain communities are living on less than $1.90 a day, mostly in Pakistan, India, and Bhutan. The average rate of deprivation is fairly consistent across the region, varying from 43% in Bhutan and China to 52% in Pakistan. The report also highlights the issue of oppression and exclusion that women face, emphasising on the implementation of policies that improve women’s participation in decision making and climate governance for equitable distribution of rights, assets, resources, and power in the region. Migration is presented in the research as an integral part of the development conversation with population movement widely perceived as a challenge in the region. Environmental governance is also emphasised to hold the key to the future the region as it involves equitable sharing of benefits, costs, and risks of sustainable development. A comprehensive analysis of the Hindu Kush Himalaya region reveals looming environmental and socio-economic challenges impacting livelihoods and mountain sustainability. 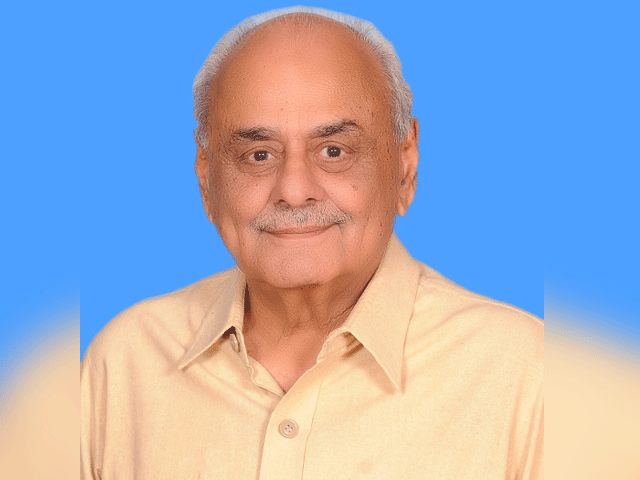 Policy measures under the assessment emphasise on the implementation of holistic and multidimensional approaches in order to meet such challenges. Policy approaches must become more holistic & multidimensional to meet the challenges arising from environmental, sociocultural & economic change in the Hindu Kush Himalaya. 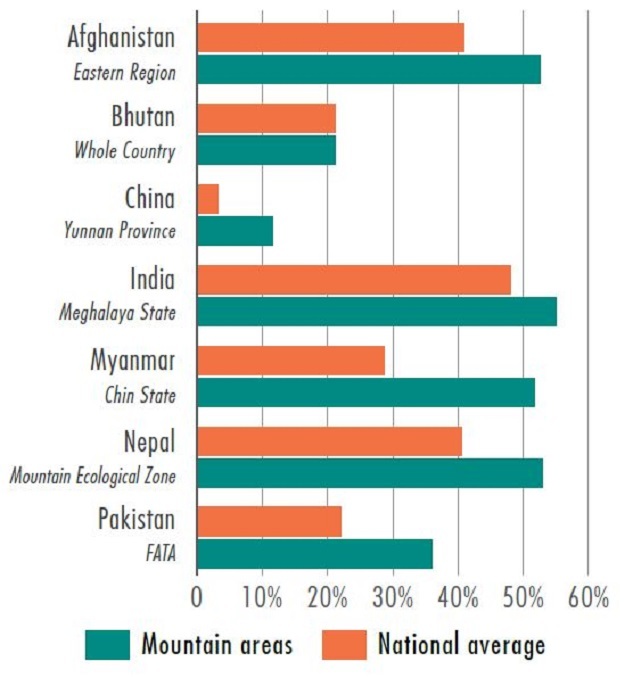 From a policy standpoint, achieving sustainable mountain development will require exploring various scenarios that focus on climate change adaption, biodiversity conservation, advancement of renewable energy, reduction in poverty and maintaining food, water, energy and livelihood security in order to sustain this global asset. Governments in the region are advised to advance the sustainable development agenda, such as the UN Sustainable Development Goals for 2030 in order to promote sustainability and responsible economic growth in the mountain regions.